Some New Haven residents feel a little art might help clean up and fight crime in their neighborhood. "It does make the place look nicer," said Steve Bean, a Wooster Square Resident, as he walked by the pictures on Chapel Street, an array of decorative images on the dog park around the corner. "Appearances are 80% of everything." Appearances are what some Elm City residents are trying to work on specifically about Lower Chapel Street--an area some feel has long been forgotten. "It really can turn that section, that block around," said Bill Bowden of Wallingford who presented his vision for the wall next to Foot Locker at Tuesday's downtown community management meeting. 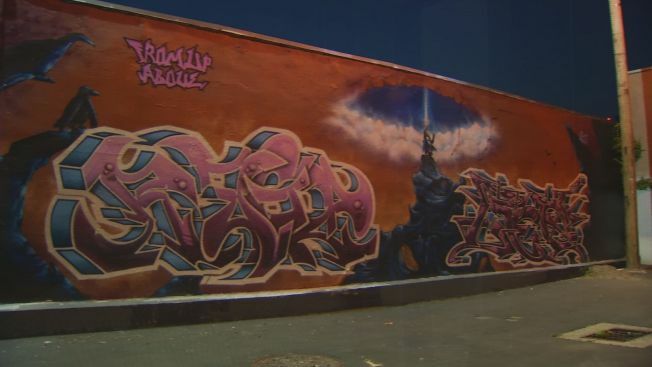 "They can bring attention and a different vibe to the city by putting their work up because it does draw a crowd and it really brings an area up." "You do that by creating that sense of feeling, that sense of connection to the buildings you're surrounding yourself with," said Alderman Doug Hausladen of Ward 7. "It feels like more people are around so probably those looking to do crime where no one else is watching, so they then skip that street," said Erin Gustafson of Wooster Square Block Watch. Residents pointed to other murals at Lenzi Park off of St. John Street as well as the big project down by Water Street. "You take these drab buildings that don't really offer a lot and you put color on them and it beautifies the city," said Ryan Christenson of Wallingford who also helped design the Water St. murals. Another thing coming to that part of Chapel Street as they have on Water Street are new L-E-D lights to make it safer to walk around. As of now the mural will be funded privately.